This window at the St. Cecilia Music Society depicts St. Cecilia, the patron saint of music, playing the organ under the protection of two guardian angels, one of whom holds a lyre. Cecilia was a young 2nd- or 3rd-century Roman Christian who obeyed her father's command to marry even though she had taken a vow of chastity. According to legend, during her wedding feast Cecilia "sang in her heart to the Lord," praying that she might remain chaste. Her new husband agreed to respect her vow when he found the bridal chamber filled with heavenly music and saw the angel who watched over her. Both Cecilia and her converted husband were later martyred for their faith. In 1584 she was chosen by the Academy of Music in Rome as its patron saint and St. Cecilia's Day on November 22 became a yearly music festival. 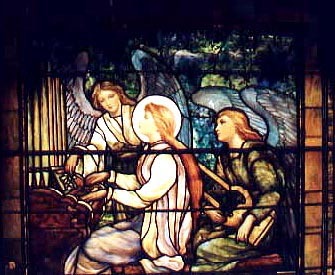 The St. Cecilia Window was made by the Tiffany Studios in New York City from a design by New York artist Frederick S. Church, a Grand Rapids native whose mother was a charter member of the St. Cecilia Music Society. His model for St. Cecilia was the noted New York beauty, Evelyn Nesbitt. Dedicated on October 11, 1895, the window is a memorial to Emma Lyon Withey Greeson, a pianist and early member of the Society, and was given by her husband, William A. Greeson, and her mother, Mrs. T. Hawley Lyon, a charter member. After being restored by the Pristine Glass Company of Grand Rapids, the century-old window was rededicated on October 20, 1995. To view another window by the Tiffany Studios, visit the Window of the Month for October 1998. Founded in 1883, the St. Cecilia Music Society was the first women's music club in the United States to have its own recital hall, which was designed by Chicago architect Henry Ives Cobb and dedicated in 1894. In 1899 the hall was the site of the National American Woman Suffrage Association's annual convention, the only time its convention was held in Michigan. Renovated and restored in 1998, the building is listed on the National Register of Historic Places. St. Cecilia Music Society of Grand Rapids was registered in the Michigan Stained Glass Census by Leisa Eckerle Hankins of Grand Rapids. Text by Betty MacDowell, Michigan Stained Glass Census, July , 1999.